This eleven piece party and function band has a stunning line up of four dynamic vocalists combined with a popular brass section. They guarantee you a unique, excitingly energetic fun event with professionally choreographed dance routines, the best stage costumes and top quality music - all tailored specifically to your needs and those of the audience. They come complete with state of the art sound equipment and technical crew using an Intelligence lighting system with an optional fibre optic star cloth and superb floor shows. They regularly perform with, for and in the presence of stars, celebrities and the famous such as The Prince's William and Harry, David Essex, Dionne Warwick, Catherine Zeta-Jones, Nicole Kidman, Martine McCutcheon, Bryn Terfel, Katherine Jenkins, Chris Tarrant, Max Clifford, Jimmy Carr, Dominic Holland, Patrick Kielty, Ant & Dec, cast of Eastenders, the Bill and Footballers’ Wives. They are reknowned for their versatility and they do not compromise on musical detail - everything is performed live and as the original. Robbie Williams - Frank Sinatra, Abba – Queen, Earth Wind & Fire – Glen Miller, Beatles – Darkness, Bon Jovi – Tina Turner - you name it they do it! 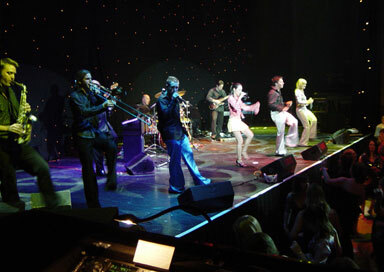 The best music… Fronted by four superb vocalists, creating a unique and hugely popular sound backed by a popular brass section and state of the art technical equipment. Catering for every mood and occasion, they individually tailor a dynamic and versatile line up of music covering the latest chart hits and tributes through the decades - powerful vocals performed with the infectious energy and enthusiasm that guarantees a fun memorable event. The best performances…With an impressive costume wardrobe and professionally choreographed dance routines, they pay tribute to the best of popular party music. The show is constantly evolving, adapting and reacting to the audience needs and tastes with unequalled visual show. The best band...A big sound creating the right party atmosphere, they are simply the best band for your corporate event. All shows are fully choreographed, costumed and are suitable as cabaret review shows at events, balls, corporate occasions or in theatres.